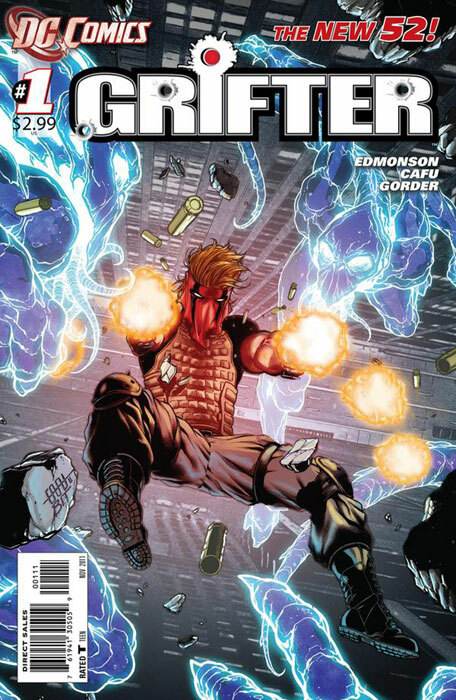 Another Wildstorm character makes his debut in the DCU and this time it’s my main man, Grifter! 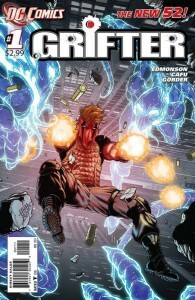 It’s been 14 years since Grifter last had a solo title so for this fan this has been a long time coming. The first thing to point out here that I think will grab people’s attention is that this Grifter title lends itself more to the feel of titles like Wildcats Vol. 2 and Wildcats: Version 3.0. Those two titles came out during a time when Wildstorm was going for a more real world feel than a superhero feel. 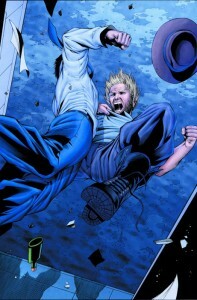 Those incarnations of the Wildcats books were also the most well-received amongst comic fans. I can safely say that fans of those two Wildcats titles will really dig this book. Writer Nathan Edmondson does what he does best by setting up a great story that starts off as well as any summer block buster movie. But then he quickly moves us back down to street level where some grim and gritty dealings show us why Cole Cash ends up with the name Grifter. 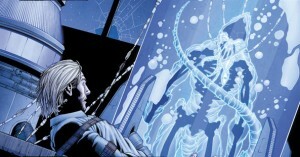 He also does well to set up the mystery of these new creatures that are threatening Grifter. To long-time Wildstorm fans, it’s no secret that what we have here is a new version of the Wildcats’ old nemesis, the Daemonites (even though they’re not named in this issue). The Daemonites have been re-imagined for this title but I really like their new design and how they’re being introduced here. It’s a story worthy of an X-files episode and equally as creepy. Next up, I have to mention CAFU’s art. Edmondson has mentioned that this is a dream project for CAFU because he loves Grifter. I think it’s apparent in every panel as CAFU does some great visuals in the book that could easily be storyboards for an action movie. He does a great job with everything he draws, whether it’s locales or simple facial expressions. It all leads to the last panel of the book that will make old Wildstorm fans squeal with joy. I couldn’t be happier with this first issue. Those who know me would say that I’m biased because of who the character is and knowing how much I love this character. Only the opposite can be true for me because in loving this character so much, I don’t like when I feel writers get it wrong with him (and it has happened in the past). I’m happy to say that I think the combination of Edmondson writing and CAFU drawing has put out one of the best books of the New 52 so far. This entry was posted in DCU, Grifter, Reviews and tagged CAFU, grifter, Nathan Edmondson. Bookmark the permalink.